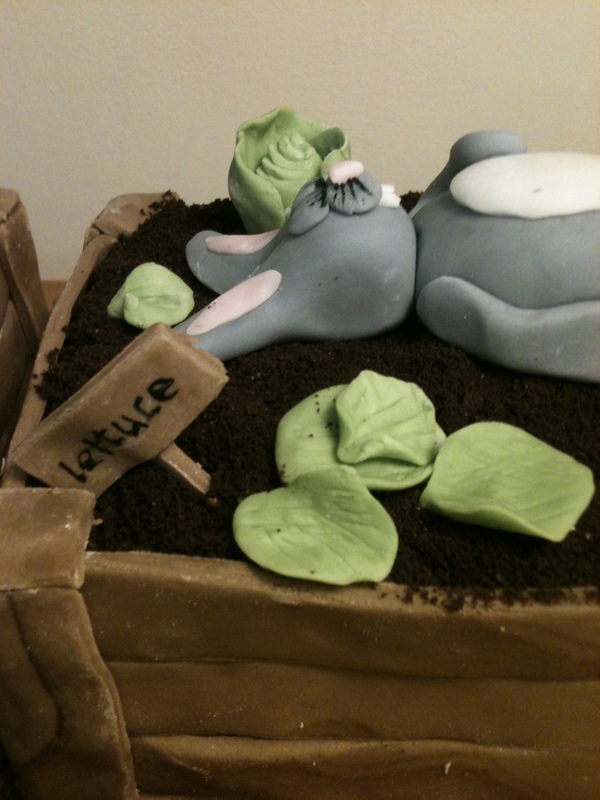 After I made a dinosaur cake for David’s son’s birthday, he asked me if I could make an Easter cake. 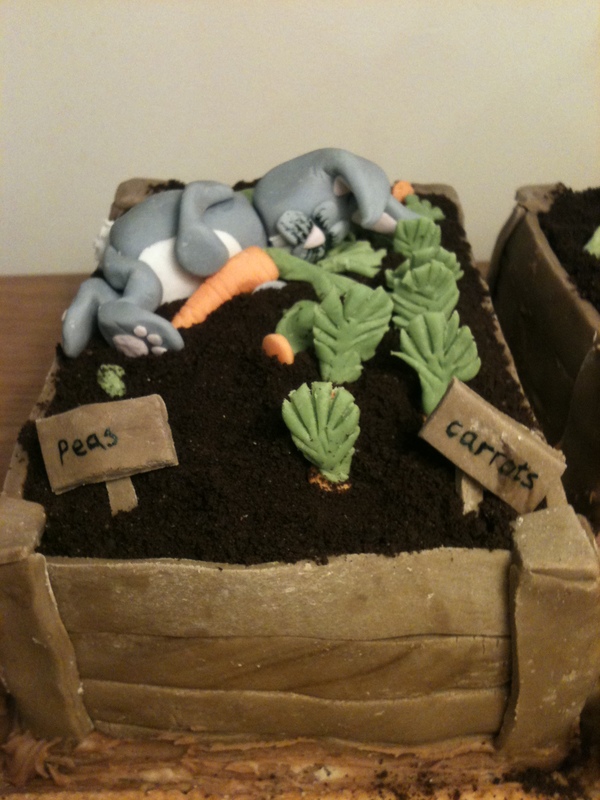 As soon as he said he wanted a silly (rather than serious) cake, I came up with an idea… I loved the style of the drunk robin cake I made at Christmas and decided to make it Easter themed – so instead of drunk robins on a tree trunk, I wanted to make bunnies who’d eaten too many carrots on a raised vegetable bed. The problem is, now I’ve made it, I want to keep it! 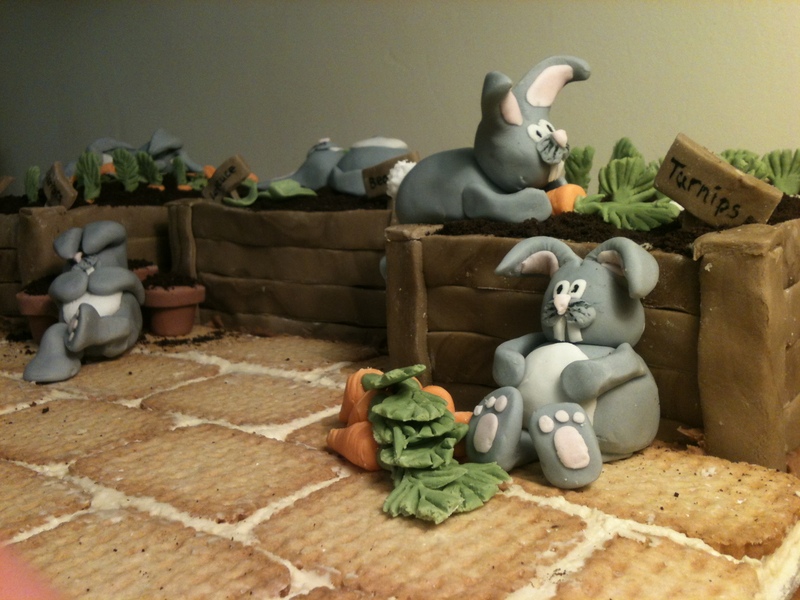 I initially thought of making one large cake, covering the sides to make it look like a wooden planter, and then decorating it with a couple of bunnies. 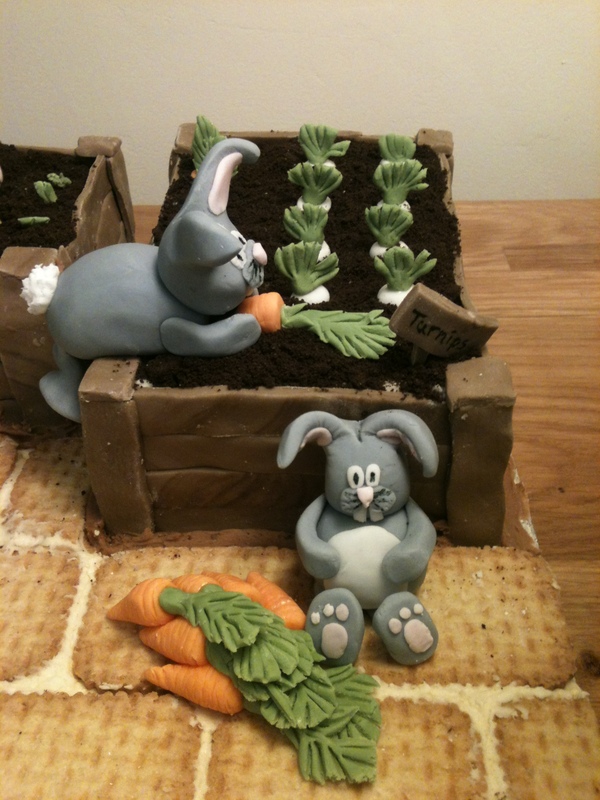 But after David asked if he could have more than one flavour of cake again, I decided that making 2 or 3 smaller “vegetable patches” would look better. I made each cake 2 layers, and they were all 6″ x 4″ cakes. There’s a victoria sponge cake, a chocolate cake (cut into 4 layers) filled with Nutella and Nutella buttercream, and finally caramel cake filled with caramel creamcheese buttercream. I covered each cake with a thin layer of buttercream and then stuck strips of brown fondant icing to the sides to look like wooded slats. I stuck strips to the corners too to make “posts”. 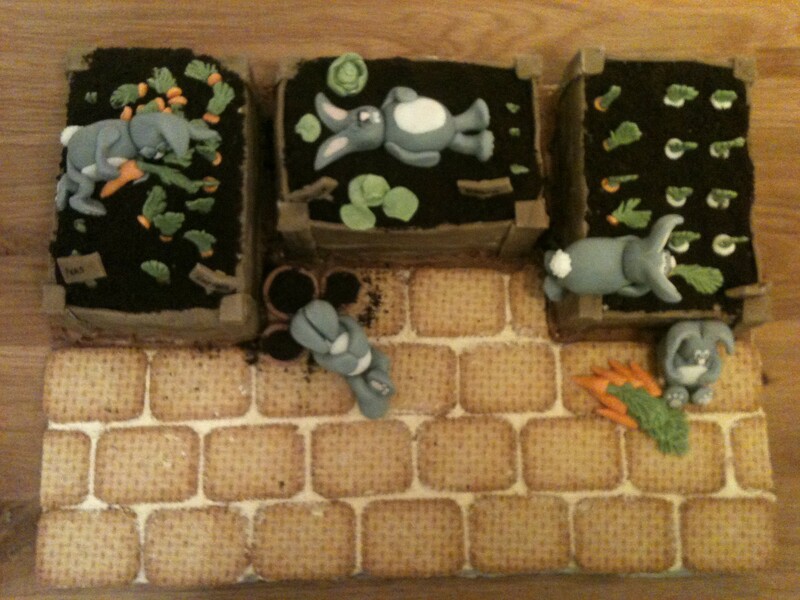 The planters were then topped with soil… crushed Oreos. I used the left over caramel buttercream to make a “patio” – I spread it over the board and then stuck upside down Nice biscuits. The rest of the decorations were all made with coloured icing. 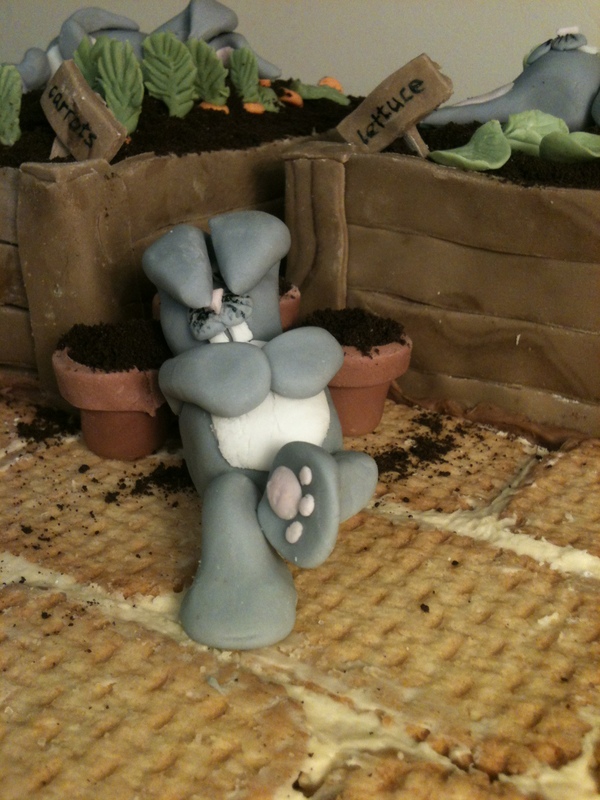 I could have carried on making the bunnies all day but realised I had to make the actual cake at some point. 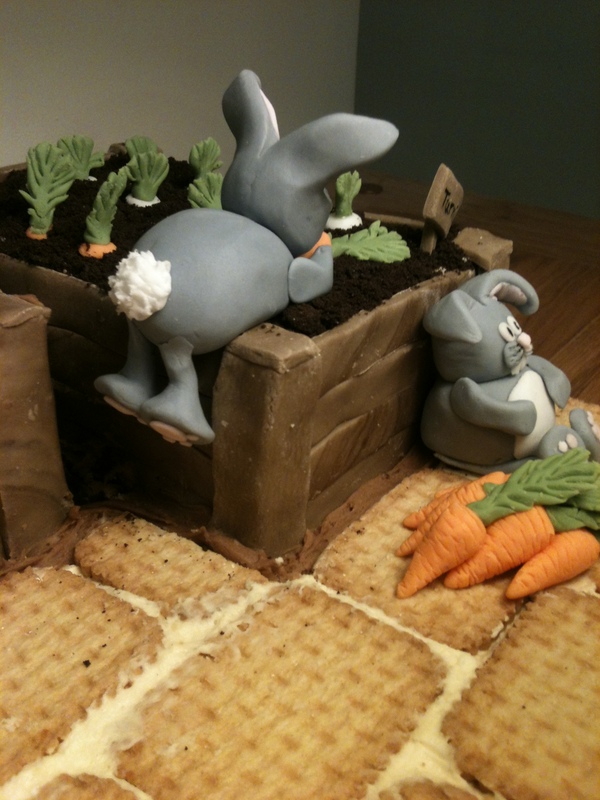 Here’s a selection of close ups of the bunnies…. Reblogged this on Sassylady's craft blog..
Gloverly Cupcakes is now on Facebook! © Gloverly Cupcakes, 2012 – 2017. Unauthorized use and/or duplication of this material without express and written permission from this site’s author and/or owner is strictly prohibited. Excerpts and links may be used, provided that full and clear credit is given to Emma Glover, Rebecca Phillips and Gloverly Cupcakes with appropriate and specific direction to the original content.